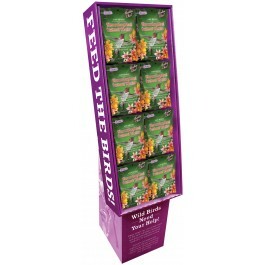 Our Free-Standing ThistHummingbird Instant Nectar Store Displays offer a great “impulse buy” opportunity for your customers. Convenient and easy-to-use, these free-standing displays are a great way for your customers to find exactly what they want. Attract nature’s beautiful hummingbirds to your backyard and gardens with Brown’s® Garden Chic!® Hummingbird Instant Nectar. Our quick and easy-to-use, high-energy nectar uses natural carmine, not artificial dyes, to create its distinctive red color. Simply mix with tap water. There’s no boiling required!